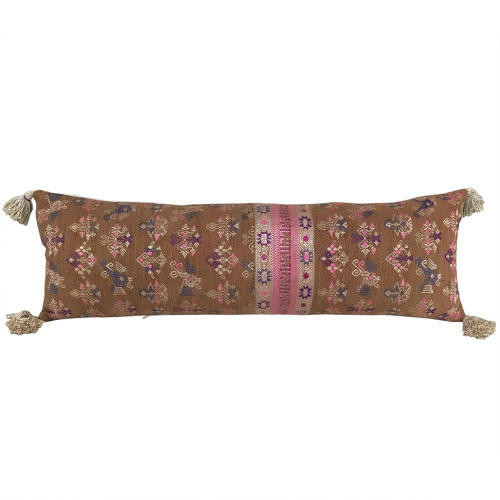 These gorgeous long cushions are made from a vintage Maonan wedding blanket with a mid brown cotton ground and pink, purple, indigo and cream silk auspicious symbols. The overall effect is beautiful and these cushions are some of my favourite. They are backed with plain vintage hemp, have zip closure and feather pads. Long cushions are perfect for dressing beds with and take up the space of 2 or more cushions of standard size. There are 2 available and they can be viewed in my studio in Purley or please ask for a shipping quote.